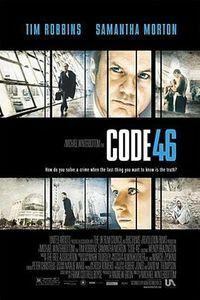 I recently watched an interesting film from the UK, "Code 46" (now on DVD). This movie will most definitely interest transhumanists and anyone concerned about the implications of reprotech and neurotech in the not-so-distant future. It's basically Gattaca meets Eternal Sunshine of the Spotless Mind, but it's not nearly as good as either. Still, it is a solid and stylish film that offers some food for thought. Any human being who shares the same nuclear gene set as another human being is deemed to be genetically identical. The relations of one are the relations of all. Due to IVF, DI embryo splitting and cloning techniques it is necessary to prevent any accidental or deliberate genetically incestuous reproduction. IV. If the parents knew they were genetically related prior to conception it is a criminal breach of Code 46. To enforce Code 46, this quasi-dystopic society has had to establish rather draconian measures to regulate the free-flow of people and to monitor the procreative status of all citizens. In this world, there are two zones where people can live and dwell; one is portioned off for those with proper genetic "clearance," and another zone for the social cast-offs. The way in which the movement of people is regulated is quite nightmarish. Everywhere people go they have to present proper identification, which itself is prone to status changes at any given time. Given today's geopolitical climate, I shuddered at the prospect of such stringent security measures and how human movement could be so strictly constrained. Other ways in which the state regulates Code 46 is through the involuntary application of neuropharma and even memory erasure. When neuropharma is administered, individuals can be compelled to have adverse reactions to particular acts and even specific individuals. Other neuropharma is taken voluntarily (i.e. recreationally or professionally (such as the lead character's empathy virus)). There are virtually no limits to what these powerful drugs can do. On reflection, I felt that the issues as raised by genetic modification and cloning were unrealistic, but the neurotech was fascinating -- mostly because I haven't seen those issues dealt with to any degree in other sci-fi films. Granted, it's never fully explained in this film why the world has become so Orwellian and why there are so many human rights violations (I suppose reactionary sci-fi films are spawned by the general assumption that future science and technology will cause the whithering away of human rights), but the implications of both voluntary and involuntary behaviour modification through biotech is a fascinating and troubling issue. Okay, I don't want to give away too much more, suffice to say that it's worth seeing. The acting is very good (Tim Robbins, Samantha Morton), it's quite stylized, and there's plenty of thoughful art candy (ie the dessert/city delineation, etc.). Be sure to check it out.